As the Deer composed by Martin Nystrom. Arranged by John Wilson. For SATB choir. Contemporary, General Worship, Praise & Worship, Sacred. Octavo. Published by Hope Publishing Company (HP.A677).John F. Wilson's lush treatment of this classic worship chorus made it a best-seller in its original SATB setting. This new voicing is for two-part mixed or optional SAB choir. 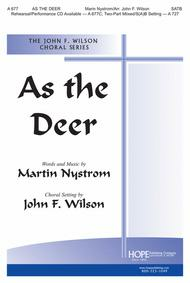 As the Deer composed by Martin Nystrom. Arranged by Keith Christopher. 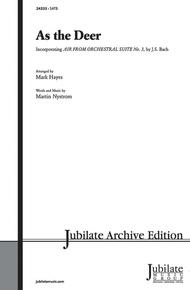 For Choral, Flute (SATB). Daybreak Choral Series. Sacred. 12 pages. Published by Daybreak Music (HL.8740834).ISBN 1423465776. Sacred. 6.75x10.5 inches.This arrangement of the Martin Nystrom chorus classic is appropriately gentle and reverent. Inspired by Psalm 42:1, “As the Deer” is easy to learn and very effective. Optional congregation and flute involvement is highly recommended! Available separately: SATB, ChoirTrax CD. 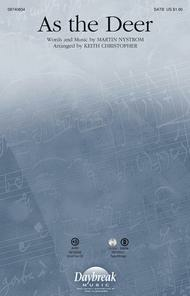 Score and parts (fl, perc, vn 1-2, va, vc, db) available as a CD-ROM and as a digital download. As the Deer (Incorporating "Air" from Orchestral Suite No. 3, by J.S. Bach). Composed by Martin Nystrom. Arranged by and orch. Mark Hayes. Choir Sacred. SATB choir. Choral (Sacred); Choral Octavo; Worship Resources. Baptism; Lent; Sacred; Spring. Grade 4. Choral Octavo. 12 pages. Published by Alfred Music (AP.24333).What an inspiration! Mark Hayes has transformed Martin Nystrom’s beautiful contemporary praise song, As the Deer, pairing it with Bach’s timeless Air on the G String. The combination is sheer genius, creating the perfect inspiration for both traditional and contemporary worship services. The optional orchestration for strings, guitar and harp, adds both elegance and relevance for today’s worship.Inst. Parts Available (choral); Recorded Acc. Available.